Mike and Sarah are watching cartoons together. The female mutant explains that she used to have watch TV in her parent’s basement as they chained her up down there because they thought she was a monster. Mikey is aghast and tells her that he thinks she’s cute… and he kisses her. Mike gets self conscious and begins to apologize, but Sarah enthusiastically leaps into his arms, knocking him over, and begins kissing him. Just then a superheroine named Rapture walks in and flips out – she screams at Mike and tells him to get lost. The Turtle tries to explain, but the woman won’t hear it and slams the door in his face. Mike walks off with a huge grin plastered on his face. Raphael, meanwhile, is really enjoying the bar fight that he’s involved in. Elsewhere, Leonardo is pleading with Roxanne to take the controls of the aircar so he can help Don and Savage Dragon battle the monster – but the reporter is too intent on filming the event. Inside, Dragon yells at Raeburn to surrender, but the creature explains that Johnny died millions of miles away in outer space, only to be reborn as Deathwatch – who has returned to give death sentences to those that convicted his former self. Savage Dragon and Donatello then open fire – but the creature dematerializes. SD is knocked unconscious and tossed out the window, fortunately he lands inside the aircar. Unfortunately for Donatello, he’s now facing Deathwatch alone. The monster grabs the mutant cyborg with four mechanical tendrils that extrude from its skeletal head and it begins to probe Don’s mind, causing him extreme pain. Deathwatch reads Donatello’s memories and discovers how he became a cycborg and then drains the Turtle’s life force, apparently killing him. As Deathwatch gloats over the victory, Don’s cyborg body awakens and explains that while Donatello’s brain was killed, its computer brain lives on. The machine then blasts the villain in the chest, killing him. 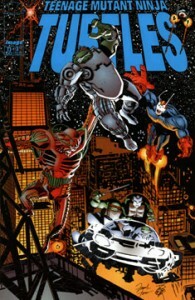 The cyborg then approaches the body of the fallen judge and attempts to administer CPR when its attacked by another alien that bursts through a wall. Roxanne leaps out of the aircar and into the room so she can film the new battle between the Cyborg and the alien, whose name is Vanguard. As Ms. Wells films, she informs Vanguard that he’s fighting the wrong person. Savgae Dragon then arrives and pulls the two apart. A small flying robot that looks like an eyeball also turns up and examines the remains of Deathwatch – and warns that the exoskeleton he wore is of Turellan origin, a computer-like alien race that interfaces with other beings via neural probes, draining the victims’ life experiences and life force as well. Dragon proclaims Don lucky to have escaped that fate, but the Cyborg informs him that Donatello is, indeed, dead. Dragon tells Leonardo to talk some sense into his brother, but the Cyborg explains that the mutagen in Don’s body has allowed its artificial intelligence to gain sentience after Donatello’s brain was fried by Deathwatch. Roxanne Wells delivers her final report. Dragon wonders if Raeburn is truly dead, and Vanguard and the eyebot explain that they’ll investigate further. Savage Dragon hops into the aircar, keeping it safe until Raph turns up to claim it, and takes off. Back in New York City, the mobsters have tapped April’s phone and are eavesdropping as Casey tells his mother to keep his location secret. The men in the van are then hit by a dart and shuriken, killing both.